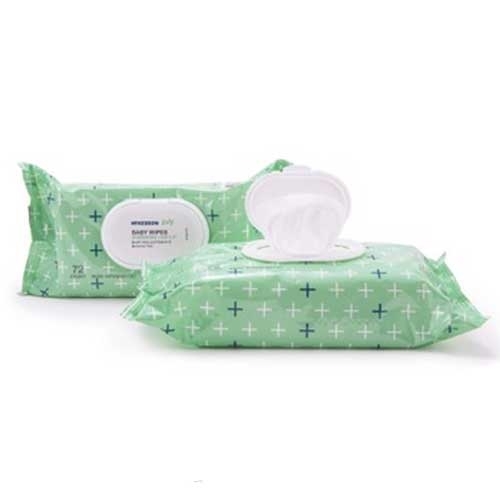 McKesson Baby Wipes with Aloe & Vitamin E are 6.8” x 7” disposable wipes that are available in scented or unscented. They are extra-strong wipes, yet soft and convenient for a variety of cleanup jobs during diaper changing time, feeding time, or playtime. The disposable wipes are moist and work like strong fluffy washcloths that help clean and soothe a baby’s soft skin. Premoistened with Aloe Vera and Vitamin E to keep baby’s skin soft and smooth. Cloths are 50 gsm large emboss spunlace. to gently cleanse personal areas on sensitive skin. Alcohol-free for a safe and gentle touch. Packaged in a soft pack with a flip-top lid for easy dispensing. Available in unscented or scented with a powder soft fragrance. Packages in soft packs of 72 wipes. I take care of an adult and need the throw away wipes to clean her up. They smell nice and the wipes are thick and easy to use. They work well for an adult and baby/kids.